The great sandwich debate: rectangles or triangles? May 19, 2017, 1:07 p.m. It is a debate that has gripped the nation since sliced bread was invented: should sandwiches be cut into triangles or rectangles? Now, to celebrate British Sandwich Week 2017, YouGov reveals the answer. Strolling through any supermarket at lunchtime reveals row upon row of sandwiches cut into triangles. But when Brits are making sandwiches for themselves, things take a very different shape. A rectangle. By more than 2:1, Brits prefer their sandwiches cut into rectangles rather than the fancier triangle (60% vs 28%). Mysteriously, a further 5% of Brits make their sandwiches in some other shape (they might not cut it at all), while 2% don’t know and a final 5% never make sandwiches for themselves. 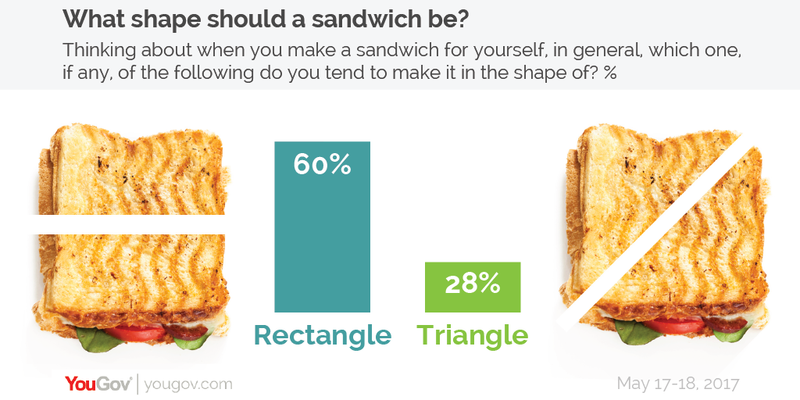 However, women are more likely than men to favour triangular sandwiches. While a fifth (21%) of men prefer triangles, for women the figure is more than a third (35%). 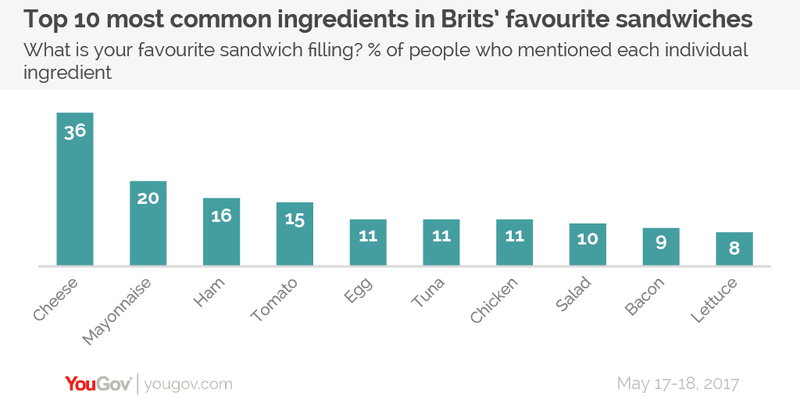 As well as shapes, the survey also looked at what ingredients are most often make their way into Britons’ sandwiches. There was a clear-cut winner: cheese. Just over a third of Brits (36%) said that they have cheese in their favourite sandwich, far ahead of the second most common ingredient, mayonnaise (20%). The top five favourite sandwich ingredients is rounded off by ham (16%), and tomato (15%) with egg, tuna and chicken in joint fifth place (11% each). Finally, in January of this year it was revealed that a Tory MP had once angered former Prime Minister, David Cameron, by not taking the crusts off his toast. In that spirit, YouGov asked how many Brits cut the crusts off their sandwiches and found only 4% do.